STUNNING! 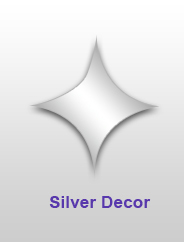 Our new Clear Butterfly Garland with Silver Glitter is romantic, dreamy and beeuutiful! The wings are made from sheer, silvery tulle that has an organza like sheen, then just the right touch of silver glitter embellishments have been added to make these butterflies absolutely gorgeous! Even the underside of these butterflies is attractive so from any angle, this garland is elegant and impressive and these butterflies are large! There are 8 butterflies and each is 7" wide by 5" long so they won't be overshadowed by other Decor. You can gently bend the wings so you can leave some all the way open or bend some inward and this variation makes a wonderful visual impact. 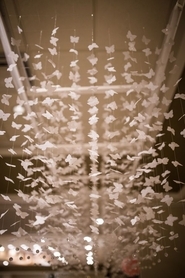 The butterflies are spaced 9" apart along a monofilament line and the garland is 6' long from the top butterfly to the faceted bead on the bottom. 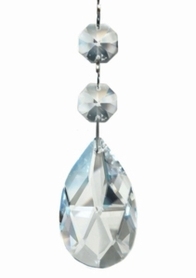 There is an additional 8" line and a hanging loop on top so the total length is 80". 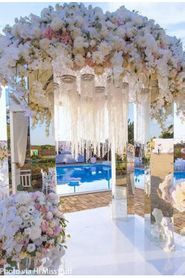 This garland is awesome as a photography prop, hanging from trees, draped through tree limbs or used on a wedding arch. Cut the butterflies off of the line and use them individually for craft projects, floral arrangements, wreaths or as classy package decorations. Create your own centerpiece designs by combining the butterflies with other accessories like mirrors and flameless candles. 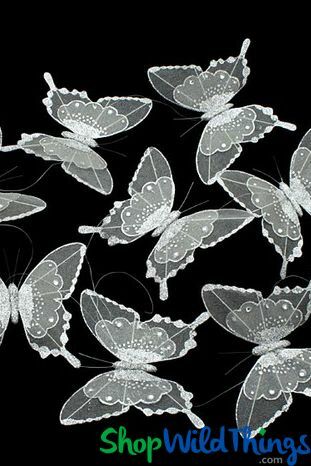 These look magnificent with tiny LED lights so one idea would be to place LED String Lights on a table, cover it with iridescent tulle and randomly place the butterflies on top or put lights, tulle and the butterflies in a clear glass vase. Beeuutiful!